In our busy modern lives, we don’t have time to waste. We need jobs done right and we need them done now. Excess rubbish and waste in or near your Friern Barnet property can be an eyesore and it’s understandable that you’d want it removed as soon as possible. This is where our N10 rubbish removal company comes in. You can call us, book with us and we will take away your rubbish as soon as you want for the best value in the area. 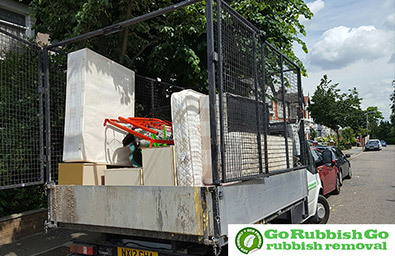 Whether you need large white goods taken away safely, or simply broken furniture, you name it, we at Go Rubbish Go will take it away and dispose of it properly. Our professional Friern Barnet rubbish disposal team are on hand to help you. Call 020 8610 9182 now and get a no obligation quotation! To keep you happy, we combine excellent service with brilliant prices. We not only carry out all waste collection in Friern Barnet safely and professionally, but we use our experience to help you and get you the best deal. There’s no need to shop around, once you’ve heard our free quote, you won’t want to go anywhere else. However, we’re not the type of company to pressure you with hard selling techniques. We let our rubbish disposal N10 service do the talking. Therefore, we won’t hassle you to part with your cash, we’ll let you make the decision. Our team is friendly and, unlike many Friern Barnet, N10 rubbish removal companies, we don’t believe in scaring or shocking customers into using us. Don’t hesitate to drop us a line via email or dial 020 8610 9182. Why Should You Pick Our Waste Collection Company in Friern Barnet? Our company are tried, tested and successful in the Friern Barnet waste disposal industry. Our priority is happy customers and we wouldn’t be here if it wasn’t for them. 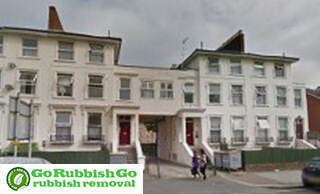 Unlike many rubbish removal Friern Barnet, N10 companies in the area, we appreciate your custom and therefore won’t charge you an arm and a leg to use our services – far from it. Our waste clearance company is the best value for money in Friern Barnet, N10. We’re far cheaper than skip hire, with come and go quickly and will get rid of your waste efficiently. We care for the environment and will do everything in our power to protect it while doing our job. We will also respond in a flash in case your rubbish related needs are urgent. Don’t hesitate to call us now! I was really surprised with the great quality of the rubbish removal service they provided last week. My house in Friern Barnet has never been more clutter-free, all thanks to this company and their perfect team! Amazing help for N10! Why Hire Experts in Friern Barnet Waste Removal? When most of us want our rubbish removed, we don’t want it in a week’s time – we want it now. Most Friern Barnet rubbish clearance N10 services don’t do this; you either have to book in advance or pay huge amounts of money to get it picked up sooner. With us, you don’t need to do either. Simply give our team a call and find out just how quickly we can get to you. We’re local to N10 and we know the Friern Barnet area like the back of our hands, so we can get to you in record time with minimal fuss and cost. Get a free quote today and see just how reasonable our N10 waste clearance services are. Don’t try and take on the heavy lifting yourself – leave it to us! Dumping rubbish anywhere you please isn’t just illegal, it’s damaging to the environment. Not only can the chemicals in white good, such as fridges, be toxic to the environment, but animals can get trapped or ingest foreign materials and perish. This is why we only dispose of waste in the safest way possible. In addition, we also recycle everything we can from the waste we collect and distribute this in the correct manner. Many materials can actually be recycled these days, but most waste removal companies in Friern Barnet don’t bother to sort through them. 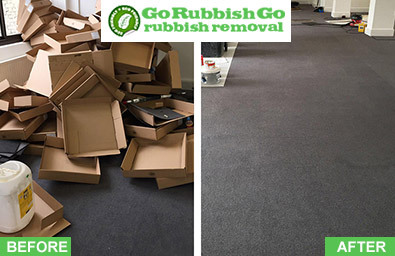 At Go Rubbish Go we do. We care about being eco-friendly and pride ourselves on conducting our N10 rubbish removal company in this way. Book now on 020 8610 9182! Friern Barnet is an area located around 7 miles from Charing Cross in the London Borough of Barnet. The area bears the N10, N11 and N12 postcodes. There is a modern housing development which is called “Friern Village”. There are lots of public parks and gardens in the area. One of the most famous parks is the Friary Park. Another one is the Coppetts Wood nature reserve which shows a great display of rare plants and wildlife. There are lots of local schools in the area such as Friern Barnet School, Coppetts Wood Primary School, Compton School and Holly Park Primary School. The nearest Underground stations are Finchley Central and Arnos Grove.